"The time fantastic service completed by professional peoplei Will be buying again"
Read our customers' honest and impartial Jaguar F PACE car reviews and ratings to easily find your next car at Motorparks. It's fine apart from a strong smell of exhaust fumes which seem to permeate the cabin at slow speeds. Jaguar assistance have been to look at it but could offer no solution at the roadside, so I will be returning it to my Dealer as soon as possible for a more thorough examination. Viewing the range of models available by other manufacturers which were looking tired and dated, we struggled for sometime to find a new 4x4 car that met our requirements of quality, refinement and style. The new Jaguar F Pace R Sport has exceeded all our expectations. We bought the 3.0 F-Pace to get a sportier drive than our old Discovery. It drives firm and fast and also is much better on fuel. We can't fault it at the moment it is just prrrrfect! My Jaguar F-Pace has lived up to all my expectations. The look of the car, internal and external, is exceptional. Once sat in the car, the position and comfort is the best I have had. Such a smooth and comfortable drive. The best retirement present I could have bought. Good points: Most importantly, it is very easy and very nice to drive and doesn't feel like such a large car. Easy to park with the sensors. R-Sport seats seem comfortable although I haven't done any long journeys yet. However bad points, standard seat adjustment is shockingly poor for a car costing nearly £50k. Should have seat tilt and lumber adjustment as standard. I didn't think that these would be optional extras as I've always had these as standard on Audis and SAABs in the past. Standard stereo is rubbish. Very poor sound quality for a car of this value and would have expected much better even for the standard fitment. Again much better standard equipment in Audis and SAABs even a Rover I owned 20 years ago came with Kenwood equipment as standard. No CD Player or SD card facilty. Will be seeking some after market equipment to imprve sound/facilities at more expense. Other than radio, can only play music off a smartphone which means I have to plug or synch something in each time I drive. This isn't very handy. Heated seats setting a bit fiddly as it is necessary to press a button and then use the infotainment system to set the temperature; seems a bit of an over-engineered way of doing what the simple button alone could have done, as in other makes. Fuel economy nowhere near manufacturer's claims Avg 32mpg. Otherwise a good car, seems well put togther let down by poor standard of internal fittings. The whole process of buying the car from Grange Brentwood was smooth and efficient. The car itself is everything we wanted and more. Yes we did go for the S model with quite a lot of additional specification but we believe it was well worth it. My wife does not like SUVs/4X4s etc but she is absolutely in love with this car. 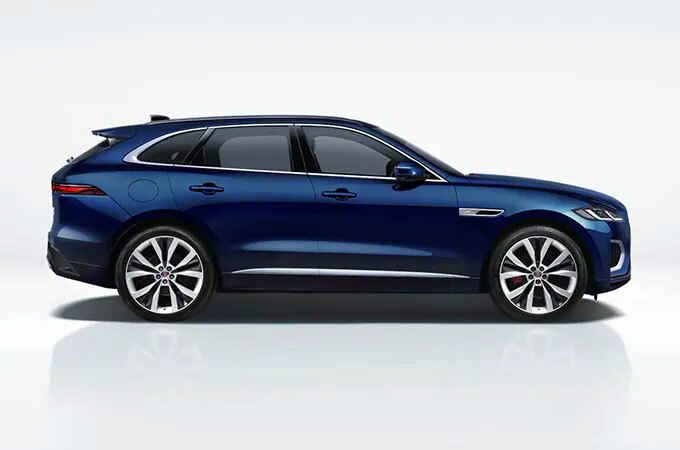 I would recommend the Jaguar F-Pace to anybody who is looking for this type of vehicle. The car is an absolute joy to drive, the handling is very sharp for an SUV and the information that passes to the driver through the steering wheel keeps the driver well informed of road condition. The cockpit is very comfortable and all controls are within easy reach. The vehicle does have a very sporty feel and when you engage dynamic sport mode it's such fun and power comes in an instant, whilst in ECO mode the drive is still very enjoyable, the auto box changes gear effortlessly and the drive is very smooth. The F-Pace is everything that I want from an SUV and so much more. Lovely car and very stable during lengthy journeys. Good acceleration and lovely balance. The IT system is very good and touch sensitive. Easy to use navigation as well as entertainment system has exceeded my expectations. Overall, a great car! I am also pleased with the services provided by Grange and whole sales process has been excellent. Our F-Pace is all we expected we are both very pleased. The F-Pace is everything I expected. It has a luxury feel to it, with the presence of a suv but with a sporty edge. At the same time lots of Jaguar character that sets it aside amongst its peers. The F-Pace looks good on the outside but the inside is disappointing considering the price. Cornering is great but at the expense of a suspension that is a tad firm. Road noise is disappointing. For overall driving experience I preferred my old XE. A lovely car, a refined ride, quiet and full of technology with the infotainment upgrade. A great looking car as well and received lots of compliments on its appearance. The cockpit is very impressive and very comfortable. I have just purchased the F-Pace S, it really is amazing, and has exceeded all my expectations. I have just clocked up 1600 miles in a week of picking the car up. It is just great for cruising on the motorways, going into towns and driving on winding roads or when you need to push hard you feel the responsive nature is there to be had. Then the rear space, load space is well great plus and the comfort on runs of 250 to 300 miles non stop I got out with a smile and relaxed. This is a truly versatile car, supported by a professional team, great job. Everything I hoped it would be, and more! Absolutely delighted with my new F-Pace S3.0d, can't help smiling every time I drive or even just see it. Really pleased with the choice I've made, looks so much better than other SUVs and is proving great fun to drive. A big thanks to Steven for his great customer service at Grange, Swindon. An utter delight to drive and in luxury.